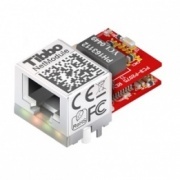 The EM1206 is a compact Tibbo BASIC/C-programmable IoT Module with Ethernet, as well as optional Wi-Fi* and GPRS** connectivity. The EM1206 has four UARTs. In combination with the RJ203 jack/magnetics front end (shown), the EM1206 forms a complete programmable Ethernet node occupying only 34.4x20mm (1.35x0.79") of the host board's space. The RJ203 can also be used in combination with the EM203 module. 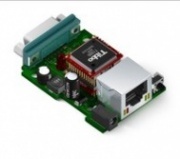 The RJ203 is an "Ethernet front-end" module that contains 10/100BaseT Ethernet magnetics and a standard RJ45 jack. This serial device server and Ethernet module provides a fast efficient way of adding ethernet funtionality to your embeded design. Maintains most of the EM1000's features, while dramatically reducing required host PCB space. A miniature, yet powerful BASIC-programmable module. 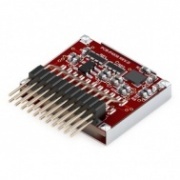 Best used with the RJ203 Ethernet front-end (also compatible with standard jack/magnetics). Being the smallest among our BASIC/C-programmable modules, the "vertical slice"
A two-board design consisting of a mainboard and an I/O board. 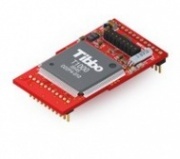 A compact BASIC-programmable board based on the EM1202 module. 10/100BaseT Ethernet, multi-channel serial port. 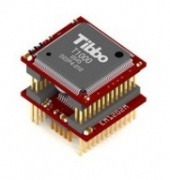 The EM1001 is Tibbo's most powerful and versatile BASIC-programmable Ethernet board.